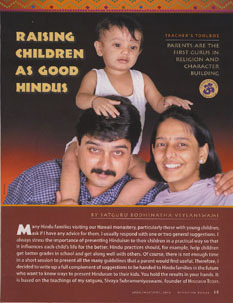 This booklet gives important guidelines for parents and teachers to teach children about Hinduism through imparting beliefs and attitudes and building good character. These include teaching about the soul and our purpose on Earth, how to live positively in the world, cultivating nine key spiritual qualities and guiding children with love, not fear. In sixteen pages of practical advice this booklet makes a perfect gift for newlyweds and would be very useful for young families and parenting classes.